Ham and green bean soup is a hearty and nourishing meal. 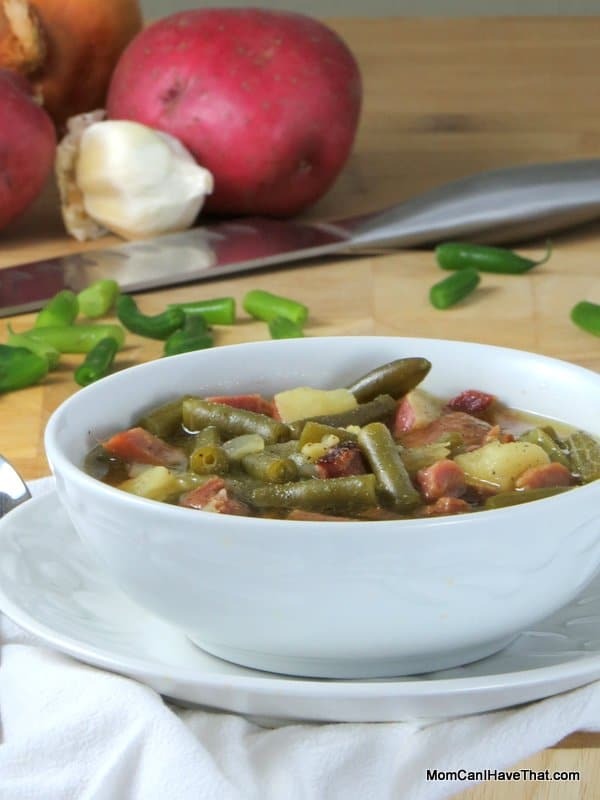 By using leftover ham and green beans, this low carb and low calorie soup comes together in a snap! 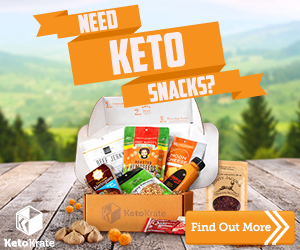 Most suitable for low carb maintenance or THM. This is one of my favorite soups and I make it every time I cook a ham. It’s the perfect way to use up some of those holiday left overs. In fact, I make sure to cook extra green beans at our holiday dinners to put in this soup. Don’t have left over beans? It’s okay. You don’t need to use left overs. My mother used to make a ham and green bean soup with flat Italian green beans — I can never find them, so I use regular green beans. This is not her recipe and I am not sure she really had one. My mother was a wonderful intuitive cook and often made things by adding a little of this and that – being guided by taste. Ham and green bean soup is most easily made when using leftover green beans and ham, but I have made it with fresh ingredients before. It’s just as good, but it comes together super fast when using holiday leftovers. I also enjoy using the juices from the ham to help flavor the soup. Those of you who are low carb may balk at the potatoes in the recipe. I understand. It is generally something we avoid – especially in weight-loss phase. 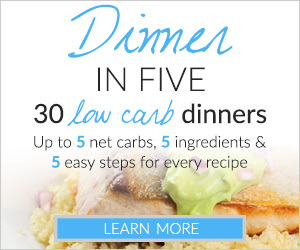 Those of you who are keto or LCHF often don’t eat root vegetables and will avoid this recipe. As I said previously, I only make this soup once a year. It tastes like “home” and reminds me of mom. 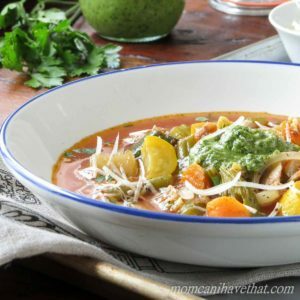 [NOTE:] This is a popular recipe with those who follow the THM (Trim Healthy Mama) program because it is low in calories and fat. I believe it is considered a “crossover meal”. 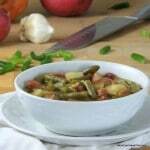 This Hearty Ham and Green Bean Soup is 10 Net Carbs Per serving. Ham and green bean soup is a hearty and nourishing meal. 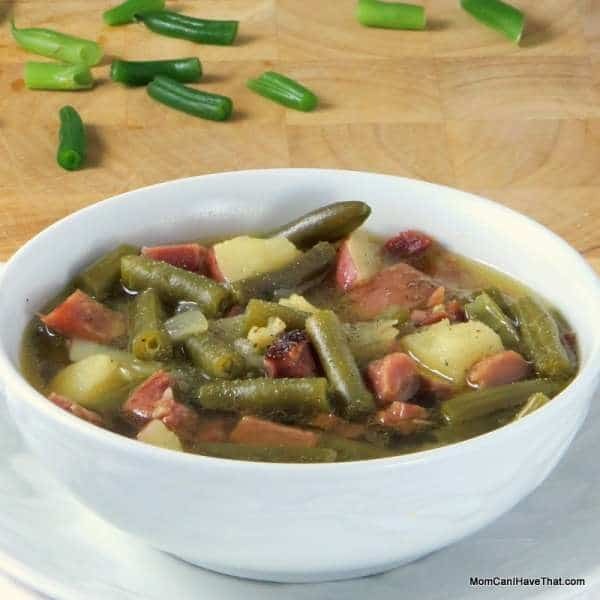 By using leftover ham and green beans, this low carb and low calorie soup comes together in a snap! Chop the onion and garlic. Put the bacon drippings or oil in a large soup pot and heat on medium heat. Saute the onions and garlic in the oil until they are translucent. While the onions are cooking, chop the potatoes into bite sized pieces. If you aren't using left over green beans, then cut the green beans, too. Pour the ham and chicken broths into the pot with the water and bring up to a low boil. Skim any foam that forms at the top of the soup. Add green beans and cook for a few minutes. Then add the potatoes, salt, liquid smoke flavoring and garlic powder. Simmer gently until the potatoes are cooked though. Add the ham and heat through. Adjust the seasonings and serve. For the BEST ham flavor, use the left over broth in the pan from cooking the ham. I commonly have 3-4 cups of broth after cooking. I freeze it if I'm not going to use it right away. It is also AWESOME for cooking your green beans. I drain my green beans and freeze the ham pot liquor again. What can use use instead of ham broth? Also can you make in instant pot? Hi! This looks delish! I’m going to try it tonight.. I don’t think it would fit in an E setting no matter what the fat count is because pork is always an S fuel. But as much as I eat when nursing it’s probably going to be a crossover regardless ;) which I’m perfectly ok with! hi Kim. 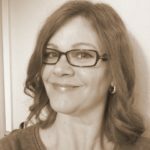 i saw your lengthy discussion about low carbs and Atkins. I am on keto so potatoes are just OUT. 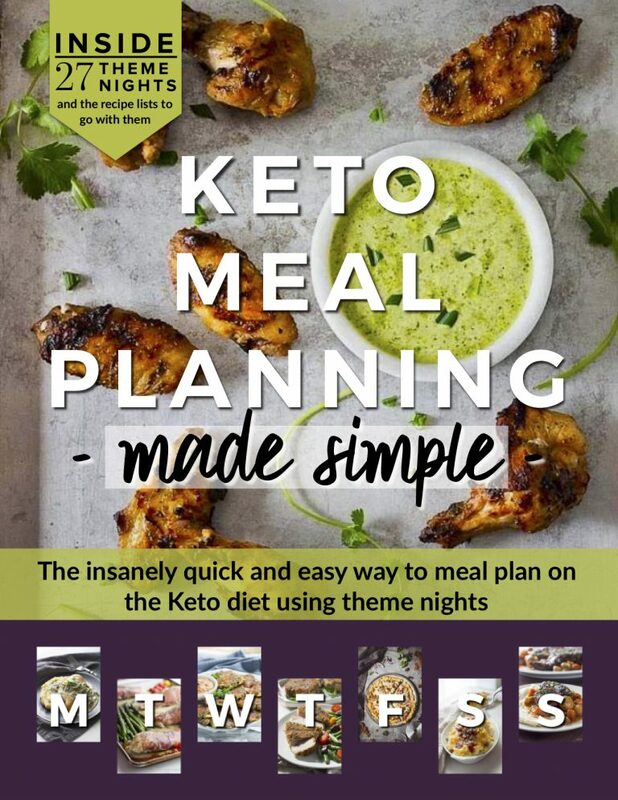 I like some of the suggestions about adding cauliflower which is a common substitution in keto. the idea of radishes is intriguing. i would need more fat of some kind, but otherwise this looks delicious. I miss soup! thanks for posting. I would make it and change out potatoes for radishes. I really enjoy cooked radishes much to my surprise! I think I’m missing somethin… Why is it not suitable for diabetics? The potatoes? My mother used to make this and so do I but I omit the potatoes. I suppose a person could use radishes or maybe cube up some Cauliflower stem in place of the potatoes but I’ve never bothered to myself. I did the math and if you wanted to leave out the red potatoes the soup would be only around 5 net carbs a serving. Same as some low carb chili I made recently. So I’m thinking this is worth a try on my newly low carb diet. Made this over the winter for a good hearty meal! You can add radish to make it even low carb count. I would imagine that cauliflower could sub partially or entirely for potatoes. Possibly turnips, though they have a tang to them that is difficult for some to get past.My mom used to make this soup when I was a kid, and I resurrected it when trying to lose a little weight (before I tried Atkins). I always found that it could help me lose several pounds if I made a giant pot of it, and ate it primarily over the course of a work week. Going to try it again with reduced or replaced potatoes and see how it goes on Atkins! Hi Lynn, that’s a great question. I’m labeling it as low carb because it is 10 net carbs per serving. With out getting into the Atkins Diet too technically, there is a concept called a “carb ladder”. Atkins followers “climb the ladder” as part of the program as they progress, to see which foods they can add back and how many carbs their body will tolerate with out them gaining weight. Many foods can be added back for those who tolerate carbs well. Higher carb foods will still only be eaten with extreme moderation, and not all people will be able to attain the level to eat potatoes. Having said that, I personally, am extremely sensitive to carbs and must stay around the 20-25 net carb level in order to lose and maintain. However, I have kids who can eat most things and I make this soup probably 1-2 times a year. I enjoy my 1 bowl at dinner the first night and then 1 bowl at dinner the next. Additionally, the amount of potato per serving is just a tiny bit over 1 ounce, which contributes 6 carbs per serving. In the context of a whole days worth of eating, I don’t have a problem with that. Other’s may.